ProMark Cool Rods are designed for a more delicate sound than the standard Hot Rods. 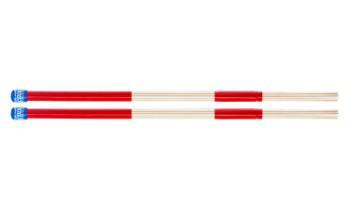 Made of premium select birch dowels, these rods provide an excellent consistency and feel. With a sound somewhere between a wire brush and a hickory drumstick, rods are the perfect sound source for the "unplugged" gig. ProMark "Alternative Sound Sources" offer a wide variety of alternatives to traditional drumsticks. Everything from brushes, to rods, to broomsticks. Achieve the sound you're looking for!